WaterproofingUK has high quality, easy to use, environmentally friendly waterproofing products for interior and exterior use at affordable prices. Our easy-to-apply waterproofing for cellars and basements will seal the walls and floor from damp and moisture. These products are great for the builder but can also be used by DIY enthusiasts. Whether you want to clean up a damp, unused cellar for storage, or are creating a comfortable living space for your family, our products can help you achieve it. The protection of houses and all other types of properties and structures from water, fire, graffiti, and rust to extend the life of and conserve buildings is our speciality. We have over 25 years experience. We understand the need to prevent water penetrating buildings, whether from the sky or through the ground. The value of your building can be saved and improved. WaterproofingUK has a range of products to help prevent the deterioration of your property. CALL US FREE on 0800 083 3289 or EMAIL US at info@waterproofinguk.com we can help you – Just Ask! Dampness and condensation: bad for a building and the people who live in it! 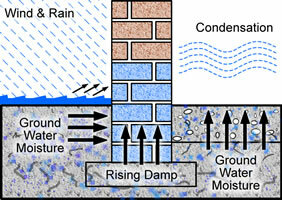 Dampness in a house can come from not only water penetration through walls, but also from the results of domestic life. The installation of a PIV Unit (Positive Input Ventilation) will drastically improve the situation. By introducing filtered dry air from the loft space, the slight positive pressure purges the vapour laden air from the house via bleed vents in windows and sundry cracks and openings around the house.